Traditionally, people with missing teeth, or structural tooth problems, like fractures or teeth severely damaged by decay, were subject to endless dental office visits and a mouthful of very unnatural looking and feeling partial denture teeth. We at Linhart Dentistry have advanced the science of crowns and bridges to offer solutions that remedy problems safely and restore a full, attractive, natural smile. Between CAD/CAM and all-ceramic options, technology has advanced to the point where restorations look spectacular and last for decades! When a tooth is fractured, has a large, old filling, or is severely damaged by decay, we may recommend the placement of a crown, or cap. Crowns strengthen and protect the remaining tooth structure and can improve the appearance of your smile. Types of crowns include the full porcelain crown, the porcelain-fused-to-metal crown and different variations of these. Crowns surround the entire tooth, unlike a veneer which just covers the visible surface of the tooth. Fitting a crown requires at least two visits to our office. Before crowns, the only real option for a broken down tooth was extraction. 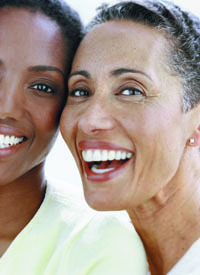 Crowns have given dentists, and in turn patients, the ability to fix certain dental situations. Cavities, or dental decay, occurs when acid-forming bacteria in the mouth are supplied with sugars. With these sugars as their food, the bacteria produce acid that eats away at the tooth, creating cavities. Usually, cavities can be drilled out and filled with tooth-colored composite (or silver amalgam) fillings. However once too much tooth structure is lost, fillings will no longer suffice and the tooth will need to either be extracted or crowned. Crowns are customized per patient, so to state their exact cost is not possible. However, when faced with the alternative of extraction, crowns are a great, simple, and cost effective way to save a tooth. Teeth are part of your body, and an extremely important part at that. To extract a tooth instead of letting it function in your mouth for years to come is a shame and a disservice. In two easy visits, crowns can transform your smile back to health and esthetic beauty, and keep it that way for many years if not the rest of your life. Preparation of Tooth: First, the tooth must be prepared for the crown. This preparation involved removing approximately 1-2mm of tooth structure from around the entire visible tooth. Usually, much of the tooth that is removed has already been damaged by decay and/or fracture. Impression: Next, an impression of the prepared tooth is taken. This impression is send to the dental lab so that they can create a new crown for the tooth that fits the prepared tooth exactly. At Linhart Dentistry we have the capability to take traditional impressions, and digital 3D impressions that remove the need for goopy, foul smelling impression materials. See our CAD/CAM page for more information! Temps: After the preparation of the tooth, a temporary crown is placed on the tooth so the patient can function normally between appointments. This temp is removed at the second visit when the final crown from the lab is ready for insertion. Lab Work: Dr. Linhart uses one the finest dental labs in the world. They create his crowns from the finest porcelain, noble, and precious metals in the world. Crowns are usually created 1) Completely of porcelain (usually front teeth), 2) From porcelain with a metal framework underneath (usually back teeth for rigidity), or 3) From gold for unique circumstances. 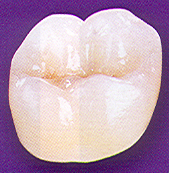 From the impression the lab is able to create a beautiful, natural, new crown for the tooth. Placement: After the lab technician creates the customized crown for the patient, Dr. Linhart skillfully cements the crown into the patient’s mouth at their second visit. He also makes any necessary adjustments at this time. Our E4D and Trios intraoral scanners and in-office mill allow us to perform SAME DAY crowns, inlays, and onlays! Two of the major questions that people ask when it comes to crowns are, What is the long-term success rate? and How long will they last? Crowns have been known to stay in the mouth for over 20 years. With proper oral hygiene and care, there is no reason why crowns cannot last for the rest of your life. Of course, as with any dental procedure, crowns may last more or less than the average expectancy, and accidents such as breakage can happen as with natural teeth. However we are confident that crowns with greatly improve your oral health and appearance for years to come. Crowns and bridges are both procedures Dr. Linhart has perfected. Along with his interdisciplinary team of dental professionals, assistants, and staff, Dr. Linhart’s Park Avenue office is the best place to have your smile beautifully restored. Bridges are used to fill in the space of a missing tooth with a natural looking substitute. Bridges can be supported by adjacent teeth, by implants, or by a combination of both. When done correctly, a bridge can make an otherwise ugly gap in your smile look natural and untouched. Although implants are an extremely viable option for replacing missing teeth, they can be expensive, and are sometimes not practical, especially if the 2 teeth adjacent to a gap need to be crowned anyway. In that situation, bridges are a great way to fix a gap in your smile! The benefits of bridges are that they can fill most gaps, they last a long time, and they look great when done by a great dentist like Dr. Jan Linhart. Bridges are customized per patient, so to state their exact cost is not possible. The cost is usually proportional to the number of teeth that are being replaced, and the location of the teeth being replaced. Bridges are a very cost effective option, however, because they last for a very long time and can rebuild a beat up smile. Preparation: First, the teeth adjacent to the gap must be prepared for the bridge. These preparations are similar to crown preparations, and are preferably done on teeth that would need to be crowned anyway. One, two, or even three teeth on each side of the gap may need to be prepared, depending on how many teeth need to be replaced. Impression: Next, an impression of entire region is taken, prepared teeth and gap. This impression is send to the dental lab so that they can create the bridge from porcelain and metal. The bridge is adapted perfectly to the tissues of the gap as too look natural but not irritate the tissue. Temps: After the preparation of the teeth and impressions, a temporary bridge is made to fill the gap between visits. This temp bridge gives the patient an idea of what the final restoration will look like. Lab Work: Dr. Linhart uses one the finest dental labs in the world. They create bridges from the finest and hardest porcelain and metals in the world. The bridges are custom made by patient in order to match color, texture, and make the new teeth look perfectly natural. Placement: After the lab technician creates the customized bridge for the patient, Dr. Linhart skillfully cements the the bridge into the patient’s mouth and makes any necessary adjustments so that the fit is perfect. How long will they last you might ask? Bridges are meant to last a lifetime. With the proper care and cleaning, there is no reason why a bridge cannot last over 15 years. Of course, like anything in the mouth, bridges are subject to many forces and breakage is possible, just like natural teeth. But rest assured, a bridge is a great option for filling that unattractive gap in your mouth. Crowns and bridges are both procedures Dr. Linhart has perfected. Along with his interdisciplinary team of dental professionals, assistants, and staff, Dr. Linhart’s Park Avenue Manhattan office is the best place to have your smile beautifully restored.